This all-in-one reference is a quick and easy way for book, magazine, online, academic, and business writers to look up sticky punctuation questions for all styles including AP (Associated Press), MLA (Modern Language Association), APA (American Psychological Association), and Chicago Manual of Style. Confused about punctuation? There’s a reason. Everywhere you turn, publications seem to follow different rules on everything from possessive apostrophes to hyphens to serial commas. Then there are all the gray areas of punctuation—situations the rule books gloss over or never mention at all. At last, help has arrived. 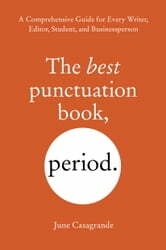 This complete reference guide from grammar columnist June Casagrande covers the basic rules of punctuation plus the finer points not addressed anywhere else, offering clear answers to perplexing questions about semicolons, quotation marks, periods, apostrophes, and more. Better yet, this is the only guide that uses handy icons to show how punctuation rules differ for book, news, academic, and science styles—so you can boldly switch between essays, online newsletters, reports, fiction, and magazine and news articles. This handbook also features rulings from an expert “Punctuation Panel” so you can see how working pros approach sticky situations. And the second half of the book features an alphabetical master list of commonly punctuated terms worth its weight in gold, combining rulings from the major style guides and showing exactly where they differ. 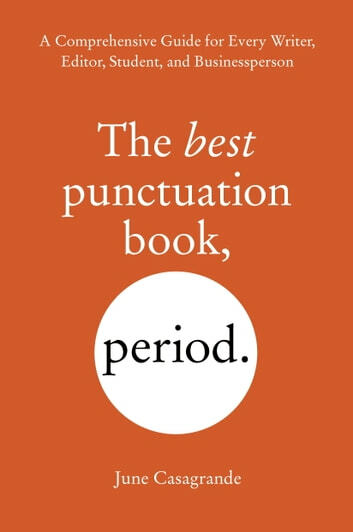 With The Best Punctuation Book, Period, you’ll be able to handle any punctuation predicament in a flash—and with aplomb. A practical guide. It is easy for me to find the information I need. There is minimal discussion. Options are clearly presented. This book scratches the itch when I am unclear on how to punctuate.